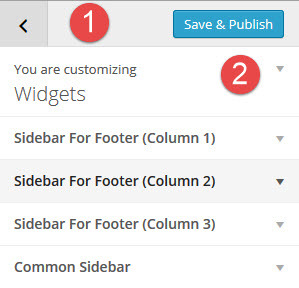 To add widgets in the customizer click the “Add A Widget”button. You will notice that the list of widgets will appear on the right side if that button and you can search for a certain widgets or if its already visible select it. The moment you select a widget it will be added to the container you started the adding widget process from and the options to be set for that widget will become visible. Set the options as you want the widget to behave itself. Once done you can save the settings in the customizer. Edit a page/post and select Right / Left option from the Sidebar Position list. Then you’ll able select to customize the order of the sidebars that will be displayed for the page. Leave the list blank to use the default settings. Once you created a new sidebar you’ll be able to select it inside the sidebar locations list.